The Plaintiff No. 1 Company was incorporated in 1980 and the word ‘SUMEET’ has been an integral ingredient of its corporate name. The Plaintiff No. 1 Company is the registered owner of the trade mark ‘SUMEET TRADITIONAL’ under Class 7 of the Trade and Merchandise Marks Act, 1958, for mixers, grinders and inter alia other household electrical appliances. On 08.02.1992 the Hon’ble Supreme Court held in Power Control Appliance C. vs. Sumeet Machines Pvt. Ltd. that the Plaintiff No. 1 Company is the owner of the Trademark ‘SUMEET’. The Plaintiff No. 1 Company also owns copyright in the label titled as ‘SUMEET TRADITIONAL’, as an ‘original artistic work’ under Section 2(c) of the Copyright Act, 1957. The Plaintiff No. 1 Company entered into an Agreement for Subcontract dated 12.04.2013 with the Defendant Company for manufacture of two specific models of mixies. However, the Defendant Company violated the Agreement by unauthorized selling of identical mixies with the Trademark ‘SUMEET’ and ‘SUMEET TRADITIONAL’. Thus, Agreement dated 12.04.2013 was terminated vide Notice dated 05.06.2013 and Letter of Termination dated 06.06.2013. The current suit has been filed by Plaintiff Company seeking a Permanent Injunction restraining the Defendant from infringing trademark, copyright, passing off, trade name, etc. Whether there was an infringement of trademark which was likely to cause confusion and deception in the minds of purchasing public. Due to extensive use over substantial period of time, the Plaintiffs’ marks SUMEET and SUMEET TRADITIONAL have acquired reputation and goodwill in the marks in India”. Furthermore, the Hon’ble Court held that the Triple Identity Test to prove the infringement of trademark has also been satisfied by the plaintiff in this case. The defendant has made use of an identical/ deceptively similar trademark in relation to identical goods having an identical trade channel (products sold vide same trading channels)”. The use of the impugned mark by the defendant was bound to cause incalculable losses, harm and injury to the plaintiffs”. The Hon’ble Court held that the Defendant had infringed the Plaintiff Company’s trademark SUMEET and SUMEET TRADITIONAL and this caused incalculable losses, harm and injury to the Plaintiff Company. The Hon’ble Court granted a Permanent Injunction restraining the Defendant Company from infringing trademark, copyright, passing off, trade name, etc. of the Plaintiff Company. 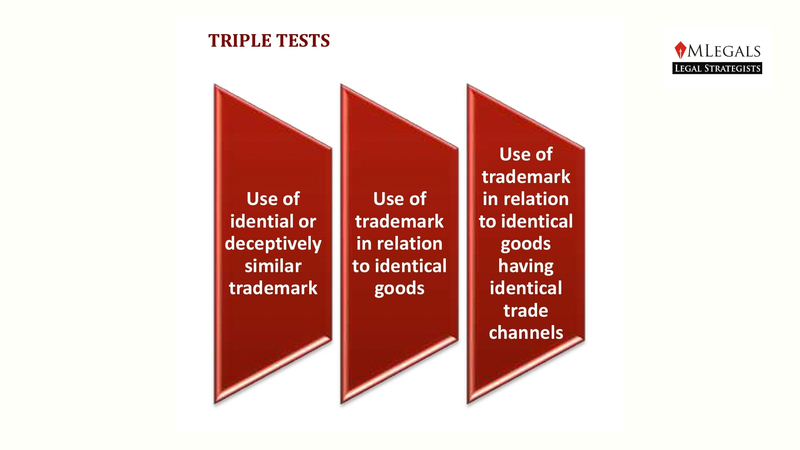 The decision of this Hon’ble Court has re-established the importance and the credibility of the Triple Identity Test in matters of Trademark infringement. The ratio laid down in this order in a realistic and simplest manner will also lead to ease of detection of infringement subject to satisfaction of such parameters in toto. Disclaimer: The information contained in this document is intended for informational purposes only and does not *constitute legal opinion, advice or any advertisement. This document is not intended to address the circumstances of any particular individual or corporate body. Readers should not act on the information provided herein without appropriate professional advice after a thorough examination of the facts and circumstances of a particular situation. There can be no assurance that the judicial/quasi-judicial authorities may not take a position contrary to the views mentioned herein.